Developed to perform under the most extreme conditions, this shifter cable kit bridges the gap between ordinary aluminum, brass, and cheap plastics used in current aftermarket shifter bushings and offers a unique Delrin, specifically chosen by Torque Solution engineers, ensuring their products performance and reliability while drastically reducing shifter end play. This allows for crisper, more precise shifts. *Please pay attention to the drop down options as there are different part numbers for 2G DSM and Evo 8/9 (5 speeds or 6 speeds). 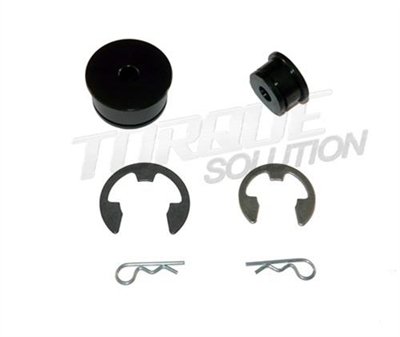 Torque Solution Shifter Cable Bushing kit for your DSM/Evo.